Bafana play their final qualification match when they host Mauritania at the Mbombela Stadium. With Cameroon already confirmed as Group M winners with a game to spare, Bafana Bafana’s 2017 AFCON qualifier with Mauritania on Friday will be all about preparations for the 2018 FIFA World Cup Qualifiers. Shakes Mashaba’s men will also be in action next week Tuesday as they square off with Egypt in the Nelson Mandela Challenge Cup at Orlando Stadium. Bafana Bafana failed to qualify for a place in the continent's biggest football prize. A lacklustre goalless draw with minnows Gambia at Moses Mabhida Stadium followed with a 3-1 defeat away to Mauritania. Mashaba’s side then locked horns with four-time African champions Cameroon, but Bafana could only come away with a point each from their two meetings; a 2-2 draw in Limbé followed by a goalless draw in Durban. South Africa walloped Gambia 4-0 in their previous qualifier thanks to a brace each from Thamsanqa Gabuza and Keagan Dolly. Mashaba’s men will face a stern test against Mauritania, who are still hoping to qualify as one of the best group runners-up. The fact that Les Mourabitones already beat Bafana in qualifying suggests that it won’t be easy. Some will see this as a meaningless match as Bafana have failed to qualify for next year’s Africa Cup of Nations. However, this will be a good opportunity to prepare for next month’s World Cup Qualifier against Burkina Faso. Mashaba has selected a squad of 25 players to play against Mauritania as well as Egypt in back-to-back matches. Mashaba has kept the bulk of the squad that has been in the national team over the last few matches and added some new faces – Abbubaker Mobara, Deolin Mekoa, Maphosa Modiba. 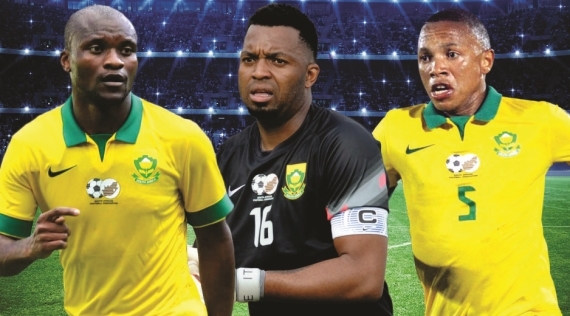 The trio was part of the squad that won the 2016 Cosafa Cup and also travelled to the Rio 2016 Olympic Games, alongside Itumeleng Khune, Thapelo Morena, Keagan Dolly and Gift Motupa who have also been called up. Ajax Cape Town duo Prince Nxumalo and Rivaldo Coetzee have withdrawn from the squad. Bafana team management confirmed that Nxumalo has a hamstring injury while Coetzee is down with chicken pox. Goalkeepers: Itumeleng Khune (Kaizer Chiefs), Jackson Mabokgwane (Orlando Pirates), Reyaad Pieterse (SuperSport United). Defenders: Ramahlwe Mphahlele (Kaizer Chiefs), Thulani Hlatshwayo (Bidvest Wits), Abbubaker Mobara (Orlando Pirates), Sifiso Hlanti (Bidvest Wits), Tebogo Langerman (Mamelodi Sundowns), Clayton Daniels (SuperSport United), Denwin Farmer (SuperSport United). Midfielders: Dean Furman (SuperSport United), Andile Jali (KV Oostende), Deolin Mekoa (Maritzburg United), Mandla Masango (Randers, Denmark), Thapelo Morena, Keagan Dolly (Both Mamelodi Sundowns), Aubrey Modiba (Cape Town City), Mpho Makola (Orlando Pirates), Hlompho Kekana (Mamelodi Sundowns). Strikers: Gift Motupa, Thamsanqa Gabuza (Both Orlando Pirates), Sibusiso Vilakazi (Mamelodi Sundowns), Tokelo Rantie (Genclerbirligi, Turkey). Mauritania still have a slim chance of qualifying for next year’s Africa Cup of Nations in Gabon as one of the best group runners-up. Les Mourabitones have one more point than Bafana Bafana in Group M‚ which has already been won by Cameroon. A draw at the Mbombela Stadium will be enough to see them finish as runners-up‚ ahead of South Africa. Corentin Martins’ side went down 1-0 to Cameroon in their first AFCON qualifier, courtesy of a late strike from Vincent Aboubakar. Mauritania bounced back strongly with a comfortable 3-1 victory over South Africa before beating Gambia 2-1. Les Mourabitones were then held to a goalless draw away to Gambia and were beaten 1-0 by Cameroon at their home ground. Martins’ side will look to inflict more misery on Bafana as they look to secure second place in Group M.
Mauritania will have nine foreign-based players in their squad‚ but the country’s captain Oumar Ndiaye has announced his retirement from international football. Ndiaye‚ who plays in the lower leagues in France‚ had played for the national team for four years. There is a first call-up for Sally Sarr‚ a 30-year-old French-born Swiss-based defender who has played in Switzerland for the last nine seasons. Strikers: Niass Amadou (Salam Zghrata‚ Lebanon)‚ Babacar Baguili (Ksar)‚ Ismael Diakité (Marsa‚ Tunisia)‚ Moulay Ahmed Khalil (Al Ansar‚ Lebanon)‚ Moctar Salem (Concorde)‚ Med Abdellahi Soudani (Moghreb Tetouan‚ Morocco). Bafana Bafana will look to end their AFCON disappointment with a solid performance as well as getting revenge on Mauritania. With home advantage, Bafana are tipped to oust their opponents.